A blast has shattered a regional bus engulfed in flames on the roadside of a Massachusetts highway. However no one was hurt thanks to the driver, who was able to get all the passengers off the vehicle. The bus with dozens of passengers was traveling from New York City to Boston when it caught fire. The cause of the blaze is still unknown. The driver did his best to avoid deaths or injuries. According to the bus operator, he pulled over and evacuated everyone on board right after noticing smoke. The company tweeted back to stressed commuters. @spinkstar6 Hi Emily, we're working with the local authorities on this, but all of our customers & their belongings are safe. A relief bus was sent over to take passengers and their belongings to the final destination. But the doomed vehicle was left to burn on the road, blocking several lanes. 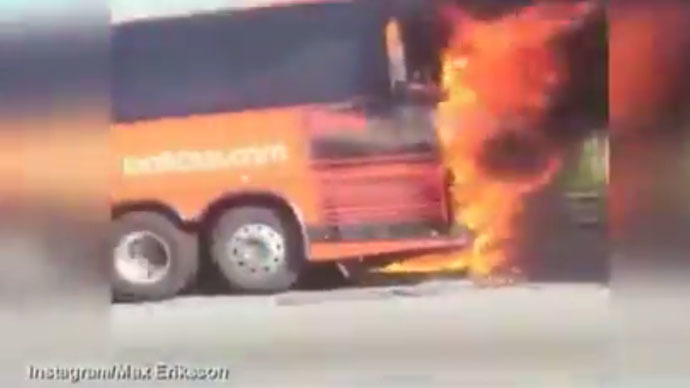 Passersby uploaded videos that showed massive flames and plumes of smoke coming from the back of the bus. The most dramatic moment of the incident was caught on what appeared to be a helicopter camera. The blazing bus exploded from the inside with the impact blowing off windows. At that time cars were still passing by within meters. Authorities say it’s a miracle that nobody was hurt in the blast, however it finally forced police to close off all eastbound lanes on the affected highway. The fire was contained within hours, but caused serious traffic delays in the area.